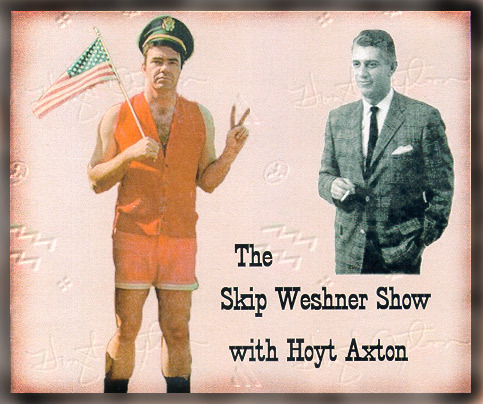 I've got all of this great material, and I want to share it with other Hoyt Axton fans, so I've had to do a lot of thinking about how to make it available and how much to charge. Obviously, I can't give it away or I'd have to have 24 hours a day to be creating CDs for everyone, plus I'd soon be broke! I already spend many, many hours a week on this hobby. So the fairest way to do this is to charge for the time it takes me to read a request, create a CD or CDs, create the labels and packaging, and mail the order. Plus, I need to add the cost of the CDs, labels, packaging, and postage. This is a "one man operation" and I don't expect to make a huge amount of sales (this isn't Elvis or the Beatles), so I can't count on bringing the cost down by volume - it will just continue to be a slow (but fun) process to create a CD or a set of CDs for other fans. 1. 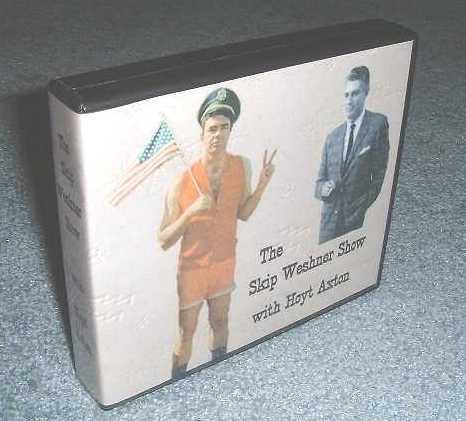 There are about 11 hours of music and dialog on the Skip Weshner tapes. I've now determined I can get it all on eight 80 minute CDs. 2. 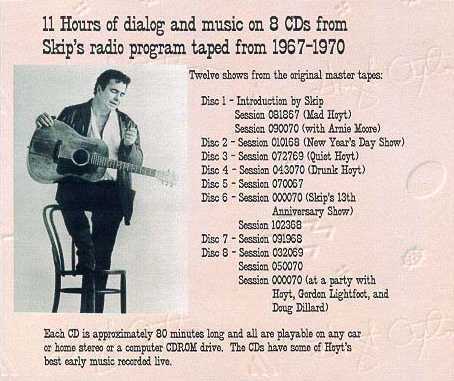 Much of the content of these sessions is dialog, and much of that, unlike Hoyt's music, isn't something that fans will want to listen to over and over. So the value of a full CD just isn't the same as a full CD of Hoyt's music recorded in high quality. Eight CDs times $25 each is $200, more than most people can afford, and because it's a lot of dialog, it's just not worth that much to all but the most diehard fans. So my dilemma is how can I cut down the cost and time to make this affordable? I think the answer is to offer a number of options, so purchasers can decide what they want and what they want to pay. This is the best, but most expensive option. Everything on the tapes (except a few parts as noted later) are on eight 80 minute CDs, recorded with CD quality .wav files. All CDs can be played on any home or car stereo or in any computer CDROM drive. The quality of the recordings is exactly what was on the tapes, and in a number of cases improved because some of the tapes had quite a bit of hum (which I removed). The edited CDs are still not perfect, but they range from good to excellent quality. Notes about quality are with each CD's description. 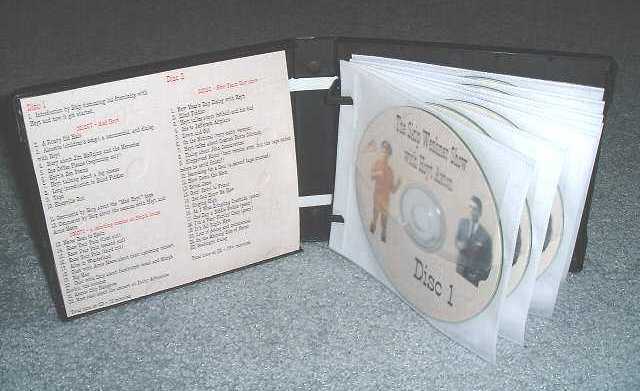 The eight CDs are packaged in a high quality rugged CD wallet as shown above, with an information booklet showing each of the sessions and track list for each CD. Out of 11 hours of tapes, much of the recording time is dialog ranging from funny and interesting to a bit boring. And because all of the sessions were completely live and unrehearsed, a lot of what Hoyt sings isn't close to "studio" quality. He often stops in the middle of a song because he forgot the lyrics or chords, or the song might be disappointing because of recording quality, background noise, or even simply running out of tape. Finally, many of the songs are repeated often in the many sessions of this three year period. Therefore, another option would be to choose only the best music from the many tapes and offer that music on a couple of CDs. This is definitely music that any Hoyt Axton fan will want to listen to over and over. Much of it is as good a quality as any music on records or CDs today. And most of these songs were never recorded elsewhere or published on any record. Hoyt sang many of the songs live at clubs like The Troubadour, Golden Bear, and others, so early fans will remember a lot of them. But unfortunately, they never made it to vinyl or CD. Until now. These two CDs have about 2 1/2 hours of the best songs in the best versions in the best quality in all of the sessions. Each song has been remastered by adjusting the channel balance, volume, and sometimes frequency equalization to get this music as close to "studio quality" as possible. By choosing this option, the purchaser gets the cream of the crop for less cost than the total 8 CD package. Plus, listening to the CDs won't get boring, by not having to wade through all of the dialog. Like the first option, both CDs will play in any car or home stereo. The two CDs are packaged in a double CD jewel case with front and back inserts. Please see the photos above for a complete track listing. Note Disc 2 has a few songs that are also listed on Disc 1, but these are excellent but different versions sung in different sessions. Option 2: Price: $45, including shipping to any U.S. address. Option 2a: Include these two CDs with Option 1 in the large CD box instead of the double jewel case for an additional $25 instead of $45. In other words, a total of 10 CDs (all of the sessions plus two music CDs) will be included rather than 8 CDs (total $120). This option is the least expensive way to get all of the sessions, but the CDROM will only include compressed .mp3 files which will not play on most car or home stereos. If you have a Windows computer with .mp3 decoding software, you can listen to each .mp3 file on your computer. Further, if you have a CDRW drive and recording software, you will be able to make your own CDs of these sessions. The .mp3 files are not quite CD quality, but most fans will be happy with the result if they are willing to spend the time to create their own CDs. The single CDROM will be supplied in a slimline jewel case. I will include a Microsoft Word .doc file and a .txt file on the CDROM, listing all of the sessions and their associated files. I have one request for those who choose this option. Please do not proliferate this rare and significant music on sites like Kazaa and Napster. This music should be appreciated by Hoyt's serious fans and not spread everywhere where just anyone can easily grab it with no effort. NOTE: This CDROM is NOT formatted to play in some of the newer CD and DVD players that will play .mp3 discs. For those players to read .mp3 discs, the discs need to be formatted a certain way for that purpose. This CDROM has all of the files you need, plus a Microsoft Word .doc file and a text .txt file for the song titles. To create a playable .mp3 disc for these newer players, you must use this CDROM in your computer and create your own disc formatted for your player. The files on this CDROM will however, be accessible on any Windows based computer. "I've listened to all the CDs and here's my review. Excellent!! The packaging is very professional. The CDs sound as good as any "store bought" CD. On some of the CDs I can even hear a cigarette being lit! It's like Hoyt is sitting in my room singing. My son says Hoyt sounds like a hippie. He's getting a laugh about words like, bread, chick, jive, groovy. Being an old hippie myself I can translate! 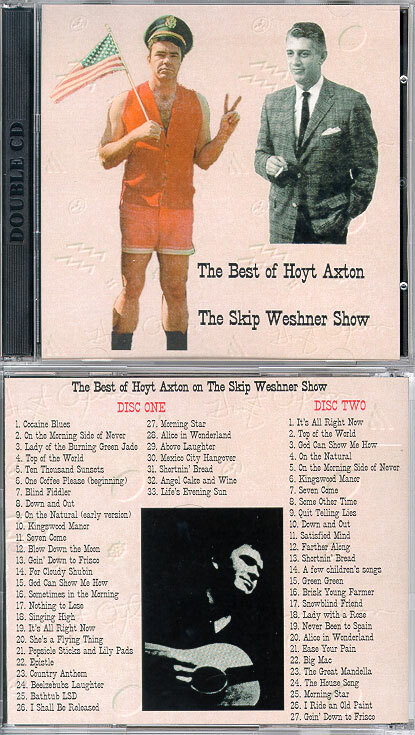 These are definitely my favorite CDs of Hoyt! Thanks again! People should know how awesome these CDs are and how much joy they bring just listening to them! If you love Hoyt, you'll love these CDs!" IT´S FANTASTIC, GREAT, JUST WONDERFUL!!!!!!!!!!!!!!!!!!!!!!!!!!!!!!!!!!!!!!!!!!!!!!!!!!!!!!!!!!!!!!!!!!!!!!!! thanx very, very much ! i think you did a damned good job ! sorry , i forgot the address of your homepage !? what again was it ??? - which other cd sets and offers do you have concerning hoyt ?! For those of you with .mp3 software, you can now download portions of a few songs on each tape. Each selected song is about 30 seconds or so, and each file size is 200-500k. The songs listed in bold italicized underlined orange like this sentence are linked to it's .mp3 file. Just click on the underlined song you want, and download it to your hard drive. 1. Introduction by Skip discussing his friendship with Hoyt and how it got started. This is from a cassette tape made sometime in the mid-1970's. 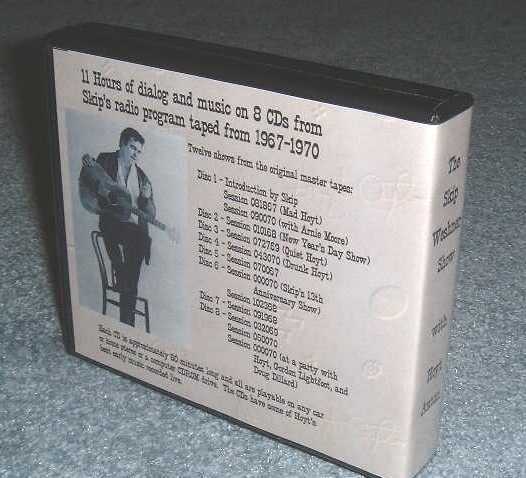 This cassette tape included two examples of the sessions taped with Hoyt. The first is "Mad Hoyt" taped during a full moon on August 18, 1967 (081867). The second is an excellent quality session taped with Hoyt and Arnie Moore, Hoyt's bass player with the Hollywood Living Room Band, in September, 1970 (090070). Both sessions listed below are from the high quality reel-to-reel tapes. 070067 - this tape is the earliest session of the collection. In order to fit the session on a CD, I had to cut a bit of dialog, mostly about a guitar belonging to Cindy Shubin, a close friend of Hoyt's and Skip's. (Click here if you would like to read about Cindy's 12-string acoustic guitar, formerly owned by Hoyt and Byrd founder, Roger McGuinn.) This is the only tape with Cocaine Blues, San Fernando, Ten Thousand Sunsets, and a few others that Hoyt used to perform frequently. It also includes one of the two versions of Top of the World. 102368 - this tape was recorded shortly after Hoyt's new album, My Griffin is Gone, was recorded. Hoyt is hoping for a November release, but notes it probably won't be until January, 1969. Shortnin' Bread, Angel Cake and Wine, and Life's Evening Sun are very good. 091968 - this session was recorded on two tapes shortly before Hoyt recorded My Griffin is Gone. Twelve songs were to be chosen for the album from sixteen on his list. Hoyt does an excellent job on a number of these songs, but he couldn't complete She's a Flying Thing, a new song by Jackson Browne. In order to fit this session on a CD, I omitted two songs (Saturday's Child and Rise Up) and a short political dialog. Although those songs are excellent*, they were only played from a record, rather than live, and didn't sound that great. Top of the World is on this disc. *If you want Saturday's Child, Rise Up, and many other rare and early songs by Hoyt on excellent quality CDs, click here for my samples page. 032069 - this tape was recorded shortly after the release of My Griffin is Gone. Hoyt does a good job on a number of these songs, including She's a Flying Thing (the only version he was able to finish in these sessions). 050070 - I couldn't hear Skip on this tape, but it seemed to be recorded at his house. I omitted a short dialog about a lost bird, due to the space available on the CD. 000070 Party with Hoyt, Gordon Lightfoot, and Doug Dillard - this tape had great potential due to the artists involved, but there were only a few cuts that were worth recording. For whatever reason, Skip didn't pay enough attention to his recording levels and most of the tape was too loud and distorted. 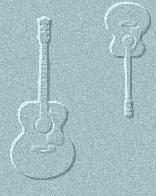 I was able to salvage two good cuts by Gordon Lightfoot, but they are far from perfect. Hoyt had too much Jim Beam, but a few songs were pretty decent. I omitted quite a bit of this tape because it wasn't worth an extra CD to record a bunch of distorted music, laughing, and background noise.